The CAGED system is a simple, elegant way to unlock the entire fretboard of your guitar. You'll never be lost trying to find a particular chord, scale or note again after mastering this technique. The beautiful thing is that you only need to memorize a few chord shapes and scale positions. After that, you are free to use this system to express your inner musician with an ease and grace you never before thought possible. These ten weeks will be packed with information, but if you follow along with each live session and follow the guided practice routines, you will be surprised with how quickly you master the CAGED system. Week 1 is all about setting the proper foundation for the rest of the course. This week Ian will talk about what the CAGED system is and how it can be used. He will also be sure you have a fundamental understanding of the chord shapes required for the course. Whatever you do, don't miss this week, as it is absolutely crucial! With the basic understanding of the CAGED system under your belt, now it is time to get through the work of memorizing the pentatonic scale positions. Remember, when you understand the CAGED system and have these positions memorized, you can play up and down the entire neck of the guitar in any key you choose. It's well worth the effort! 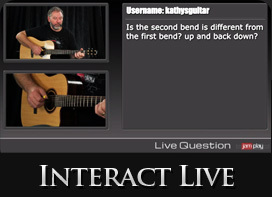 This session covers pentatonic positions 1 and 4 in the G and C types. We move on to learn the 2nd and 5th pentatonic positions using the E and A types. After learning them, Ian will dish out some useful exercises and talk about moving the positions around. We move on to learn the 2nd and 5th pentatonic positions in the E and G types. After learning them, Ian will dish out some useful exercises and talk about moving the positions around. We move on to learn the 4th and 2nd pentatonic patterns in the C and E type. After learning them, we will run through some exercises to cement this knowledge in your head. We move on to learn the 5th and 3rd pentatonic patterns in the A and D type. We will then apply these positions to some exercises and over a loop. With all of the chords and patterns under your belt we can now bring things all together. We are going to look at playing all across the neck in two different keys. This is where things get fun and exciting. Get ready to unleash your inner guitar beast! This week we will take a look at two unique backing tracks and play over them using the CAGED system. This is where things really start to get fun and all the hard work pays off. This lesson will focus on traditional applications of the system over tracks, and also touch on using vamps. This week we will play along with two more backing tracks and look at alternate approaches to apply the CAGED system. Get ready for some fun! 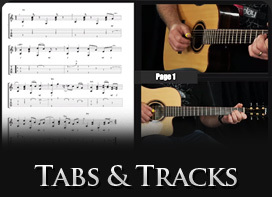 For the final week of this course, we take a look at one last backing track. 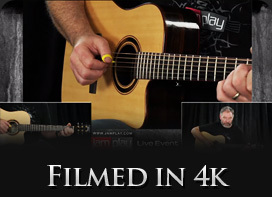 This week we will jamming over it and talking about "cycle 4" chord progressions. Don't worry, it's not as hard as it sounds.